There are physical limits to growth on a finite planet. In 1972, the Club of Rome issued their groundbreaking report--Limits to Growth (twelve million copies in thirty-seven languages). The authors predicted that by about 2030, our planet would feel a serious squeeze on natural resources, and they were right on target. In 2009, the Stockholm Resilience Center introduced the concept of planetary boundaries to help the public envision the nature of the challenges posed by limits to growth and physical/biological boundaries. They defined nine boundaries critical to human existence that, if crossed, could generate abrupt or irreversible environmental changes. These boundaries apply to the economy because the economy is a wholly-owned subsidiary of the ecosystems that make life on earth possible. (Some understanding of ecology should be a prerequisite for an advanced degree in economics!) Scientists are concerned that we have already overstepped the boundaries on biogeochemical flows (nitrogen) and biosphere integrity (genetic biodiversity). 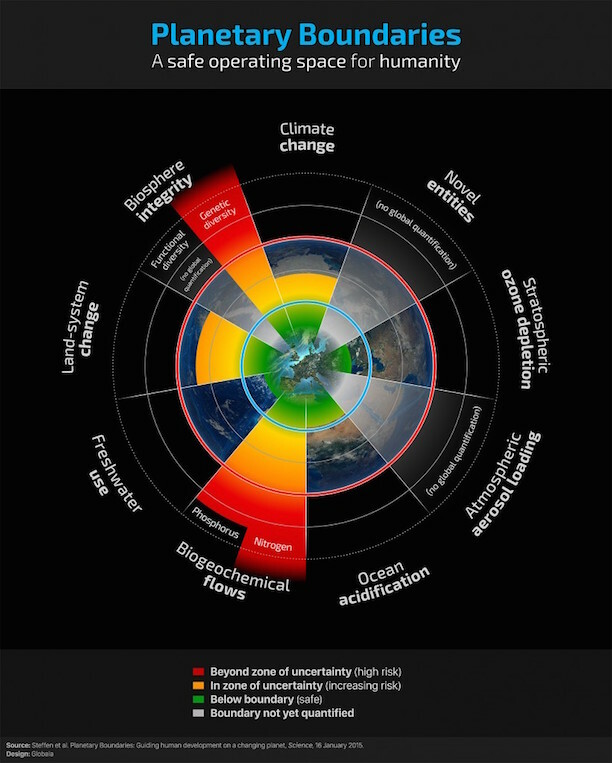 Today’s global economy and the various regional and national economies regularly neglect planetary boundaries. Crossing a boundary is tantamount to crashing through a guardrail and plunging over a cliff. The blind encouragement of economic growth that does not respect these boundaries is setting up human civilizations for collapse. Two of the most harmful types of growth are ruthless and futureless. (1) Replacing the GDP as a measure of well-being (lots of work has been done on coming up with an index of sustainable productivity). (2) Getting the Securities and Exchange Commission (SEC) to require corporations to disclose their pollution externalities (the SEC is not hopeless, as can be seen by its recent decision to require CEOs to publish their salaries along with those of the average workers at their companies). (3) Going to a four-day work week to secure fuller employment (this has happened in some European countries; Canadian economist Peter Victor has papers on why this is a crucial transition step). (4) Dematerializing the economy (i.e., so that it’s cheaper to repair an appliance than it is to buy a new one). (5) Identifying the areas in which the economy should grow--and those where it should shrink or degrow (i.e., the usage of fossil fuels must shrink sharply, and in so doing, roof-top solar will grow to become a much larger part of the global economy). (6) Identifying the most heinous types of economic growth (ruthless and futureless) and showing how their costs exceed their benefits. (7) Stabilizing population growth to keep humanity from further transgression of the nine boundaries. (2) Requiring all foreign assistance to be designed so that women will be better off as a result. (3) Making contraceptives widely available. Our global economy is treating the planet as if it were a business in a liquidation sale. Even environmental organizations--devoted to environmental protection--have been slow to acknowledge the major causes of environmental degradation, such as perverse economic incentives encouraging raw resource extraction and non-renewable energy use. We need environmental leaders to speak out for a new, just, and true-cost economy; and to challenge the mindless embracing of economic growth--even ruthless and futureless growth. Environmental leaders should be driving the push toward refocusing economic thinking on the changes that we will have to make if we are going to move to a healthier economy that exists within the nine planetary boundaries. Only if humanity stays within these nine boundaries can it continue to develop and thrive for generations to come. 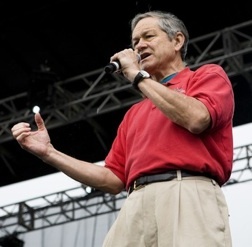 Brent Blackwelder is president emeritus of Friends of the Earth - U.S. He has had other fine articles on CultureChange.org. It’s not that I’m pessimistic; however, in my opinion, those ideas are simply utopia. Cigarettes are dangerous for health, but can any authority/country prevent people from smoking? Yes, this article is Utopian! We need more Utopian thinking, more questioning of the miserable status quo, more using our heads for something other than selfies and resting places for cell phones. Understanding the necessity of a steady state human economy is not only Utopian, it is pragmatic and ultimately practical. No other species lives beyond its means, consumes more than its share of resources, grows beyond the bounds of natural limits and cycles of resource availability. It's time for humans to grow up and starting acting as if we are part of the natural world, not separate and apart from it. There's no god sitting up nights to admire his handiwork, no supreme being to give humans special dispensation to dominate the world and bend it to our personal desires. It's long past time to take our rightful place as partners in this world, alongside of all life, not above. Our present path is bankrupt. When you're standing at the edge of the abyss, with your toe hairs flapping in the breeze, it's time to take a step back. Or, if you don't like that, turn around and take a step forward. The whole world is waiting for us to join up and pull our own weight. "No one could exceed my cynical view of humanity but I also could not agree with the writer and Mr. Lewis more. Whether the human species wakes up and grows up is yet another question. The jury is out on that one. Let's hope we humans are smart enough to save our own behinds, not to mention all the wondrous life with which we share the planet." - from Ron Landskroner, who had technical trouble posting this comment directly. The issues are critical, and the empowerment of women is interesting. Nevertheless, even women need to be oriented towards the necessary understandings, like mental health, ecological literacy, and social/solidarity ecological economics. Just shopping in health / natural food stores, and then getting into a food co-op meant that I lived in a different world from most supermarkets, and that had lots in common with farmers markets. These are approaches like those Francis Moore Lappe has talked about, along with Vandana Shiva, all being approaches expanding on efforts by Ralph Nader, Gloria Steinem, and so on from years ago.